For other uses, see PFLAG (disambiguation). PFLAG, formerly known as Parents, Families and Friends of Lesbians and Gays, is the United States' largest organization for parents, families, friends, and allies united with people who are lesbian, gay, bisexual, transgender, and queer (LGBTQ). PFLAG has more than 500 chapters across the United States, with more than 200,000 members and supporters. The acronym PFLAG, pronounced "P-FLAG" /ˈpiːflæɡ/, originally stood for Parents and Friends of Lesbians and Gays (later broadened to Parents, Families and Friends of Lesbians and Gays). Until removal of the hyphen in 1993 the name was officially styled as P-FLAG. In 2014 the membership of the organization voted to officially change the name to PFLAG to reflect the decades of fully inclusive work it had been doing in the LGBTQ community. Jeanne Manford marching with her now-famous sign. Reactions to this sign led Manford to create a support group, which evolved into PFLAG. In April 1972, Jeanne Manford, an elementary school teacher, and her husband were at home in Flushing, Queens, when they learned from a hospital's telephone call that her son Morty, a gay activist, had been beaten while distributing flyers inside the fiftieth annual Inner Circle dinner, a political gathering in New York City. In response, she wrote a letter of protest to the New York Post that identified herself as the mother of a gay protester and complained of police inaction. She gave interviews to radio and television shows in several cities in the weeks that followed, sometimes accompanied by her husband or son. On June 25, she participated with her son in the New York Pride March, carrying a hand-lettered sign that read "Parents of Gays Unite in Support for Our Children". Prompted by their enthusiastic reception, they developed an idea for an organization of the parents of gays and lesbians that could be, she later said, "a bridge between the gay community and the heterosexual community". They were soon holding meetings for such parents, with her husband participating as well. She called him "a very articulate person ... a much better speaker than I. He was right along with me on everything." The first formal meeting took place on March 26, 1973 at the Metropolitan-Duane Methodist Church in Greenwich Village (now the Church of the Village). Approximately 20 people attended. In the next few years, through word of mouth and community need, similar groups sprang up around the country, offering "safe havens" and mutual support for parents with gay and lesbian children. Following the 1979 National March on Washington for Lesbian and Gay Rights, representatives from these groups met for the first time in Washington, DC. By 1980, PFLAG, then known as Parents FLAG, began to distribute information to educational institutions and communities of faith nationwide, establishing itself as a source of information for the general public. When Adele Starr, who organized the Los Angeles P-FLAG chapter, called “Dear Abby” to discuss the purpose of P-FLAG, "Dear Abby" mentioned PFLAG in one of her advice columns. Los Angeles P-FLAG then received more than 7,500 letters requesting information. Every letter was answered by a member of the chapter. In 1981, members decided to launch a national organization. The first PFLAG office was established in Los Angeles under founding president Adele Starr. In time the scope of the organization expanded to include bisexuals, and ultimately, transgender people, but the name remained P-FLAG. 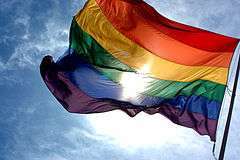 In particular, in 1998, gender identity, including transgender people, was added to the mission of PFLAG after a vote at their annual meeting in San Francisco. PFLAG was the first national LGBT organization to officially adopt a transgender-inclusive policy for its work, vowing not only to include transgender people in all of its work, but also never to support any policies or laws that are not trans-inclusive. In 2002, PFLAG's Transgender Network, also known as TNET, became PFLAG's first official "Special Affiliate," recognized with the same privileges and responsibilities as regular chapters. In 2013, TNET was replaced by the Transgender and Gender Nonconforming (TGNC) Advisory Council. In 2013, a bronze plaque was installed at The Church of the Village in Greenwich Village, memorializing the fact that the first meeting of what came to be PFLAG was held at the church in 1973. The plaque reads, "In 1972, Queens schoolteacher Jeanne Manford walked alongside her gay son, activist Morty Manford, at the Christopher Street Liberation Day Parade, carrying a sign that read 'Parents of Gays: Unite in Support of Our Children.' The overwhelming response to that simple act led Jeanne, her husband Jules, and early pioneers of the LGBT equality movement to create a support group for LGBT people, their parents, family, and friends. The first meeting of that group - now known as PFLAG - took place on this site in March 1973. Placed by the Greenwich Village Society for Historic Preservation in partnership with PFLAG members everywhere, in honor of the legacy of love that began here". Straight for Equality is a national outreach and education project created by PFLAG National to empower new straight allies and trans allies who, unlike a more traditional PFLAG member, don’t necessarily have a family or friend connection to the LGBTQ community. The Straight for Equality project was launched in 2007. This nationwide initiative expanded the organization’s efforts to include more people in the equality movement than ever before. With almost 40 years of being the “straight voice in the gay movement” no other organization has as successful a track record in educating and empowering parents, families, friends and allies. Since the 2007 launch, Straight for Equality in the Workplace has been PFLAG's most successful initiative, with an always-developing array of workshops available to corporations in the US. In 2009, PFLAG launched Straight for Equality in Healthcare to educate and engage healthcare providers in all disciplines to be more culturally-inclusive in their work. In 2012, PFLAG launched Straight for Equality in Faith Communities, which features faith-focused resources and tools for people of all denominations to start having critical conversations in their faith communities to create more welcoming institutions. And in 2014, PFLAG launched a new trans ally program through Straight for Equality. Each year since 2009, PFLAG National has held the Straight for Equality Awards Gala, the only awards gala that exclusively celebrates the contributions of straight allies to the movement for LGBT equality. Past winners include civil rights pioneers like Maya Angelou and Johnnetta B. Cole; entertainer Liza Minnelli; actors Rosie Perez, Patrick Stewart, and Sigourney Weaver; Broadway stars Audra McDonald and Will Swenson; sports icons Brendon Ayanbadejo, Scott Fujita, Chris Kluwe, and Hudson Taylor; authors Charlaine Harris and John Irving; faith leaders like the Rev. Jay Bakker; and organizations including IBM, KPMG, MetLife, Sodexo, and Whirlpool. 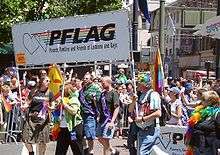 PFLAG contingent at San Francisco Pride, 2004. "Stay Close" is a campaign started in 2006 by PFLAG NYC which encouraged the family and friends of LGBT persons to give them support. In the mid-1990s, "Project Open Mind" caused some controversy from Pat Robertson. He threatened to sue PFLAG and any television station that aired the project's ads, which showed clips of anti-LGBT quotes from several people, including Robertson, Jerry Falwell, and United States Sen. Jesse Helms. The ads can currently be seen on the Commercial Closet webpage. In the early 1990s, PFLAG chapters in Massachusetts helped pass the first Safe Schools legislation in the country. By the mid-1990s a PFLAG family was responsible for the Department of Education’s ruling that Title IX also protected gay and lesbian students from harassment based on sexual orientation. PFLAG put the Religious Right on the defensive, when Pat Robertson threatened to sue any station that carried Project Open Mind advertisements. The resulting media coverage drew national attention to PFLAG's message linking hate speech with hate crimes and LGBT teen suicide. Similarly-purposed (and sometimes similarly-named) organizations have been established outside of the United States since PFLAG's 1972 establishment, although the majority of such organizations are unaffiliated with each other or with the US PFLAG. Most recently, a PFLAG organization in People's Republic of China, PFLAG China was established in June 2008 by Wu Youjian in Guangzhou after accepting her son's homosexuality. The organization is featured in the TV movie Prayers for Bobby. In the US version of Queer as Folk, characters Debbie Novotny and Jennifer Taylor are members of the organization with Debbie serving as chapter president and Jennifer joining soon after finding out her son is gay. PFLAG National provided guidance and support to Degrassi High when the show introduced its first transgender character in 2010. It offered a special resources page for viewers who wanted more information on trans issues. ↑ "See banner styled P-FLAG". PFLAG. Retrieved 2010-06-30. ↑ "PFLAG NATIONAL ANNOUNCES NEW PRESIDENT, NEW INCLUSIVE NAME". PFLAG. Retrieved 2014-10-27. ↑ Lambert, Bruce (15 May 1992). "Morty Manford, 41, a Lawyer And Early Gay-Rights Advocate". New York Times. Retrieved 10 September 2012. ↑ "PFLAG National Blog". PFLAG National. 2013-03-08. ↑ "Seattle Gay News - Page 3 - PFLAG pioneer Adele Starr dies at 90 - Friday, December 17, 2010 - Volume 38 Issue 51". SGN. Retrieved 2015-06-09. 1 2 "PFLAG National". Community.pflag.org. Retrieved 2015-06-09. ↑ "PFLAG: Policy Statements". PFLAG. Archived from the original on June 17, 2010. Retrieved 2010-06-30. ↑ "PFLAG National". Community.pflag.org. Retrieved 2015-06-09. ↑ "Chicago Gay and Lesbian Hall of Fame". Glhalloffame.org. Retrieved 2015-06-09. 1 2 Berman, Andrew. "PFLAG Historic Plaque Unveiling On A Beautiful Day". Gvshp.org. Retrieved 2015-06-09. ↑ "The Straight for Equality Gala". Straight For Equality. 2015-01-22. Retrieved 2015-06-09. ↑ "Stay Close::Pflag". Stay Close. Archived from the original on February 9, 2006. ↑ Gallagher, John (November 12, 1996). "Making airwaves". The Advocate. pp. 30, 32. Retrieved 6 September 2012. ↑ Carmody, John (November 10, 1995). "The TV Column". Washington Post. p. F8. Retrieved 6 September 2012. ↑ "PFLAG National". Community.pflag.org. 1973-03-26. Retrieved 2015-06-09. Wikimedia Commons has media related to Parents, Families and Friends of Lesbians and Gays.